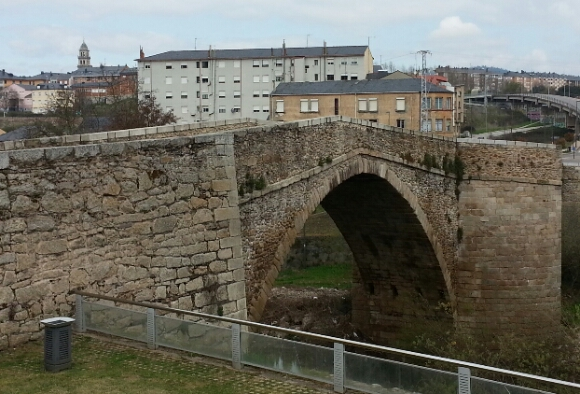 After coffee at Cafe/Albergue Pichon in Molinasesa, where the woman recognized me from my stay last November, we enjoyed a leisurely 8-km walk to Ponferrada. 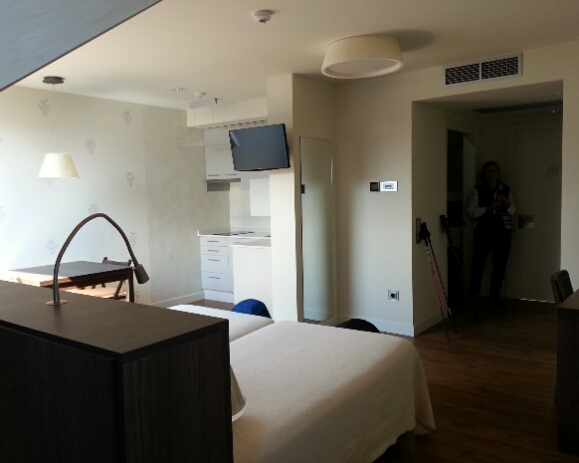 In Ponferrada we checked into the luxurious Albergue Guiana, which also has private rooms and 2 apartments. The albergue beds were €12 and looked very nice. The double rooms (€50) were taken so we accepted a studio apartment for €60. What a treat! 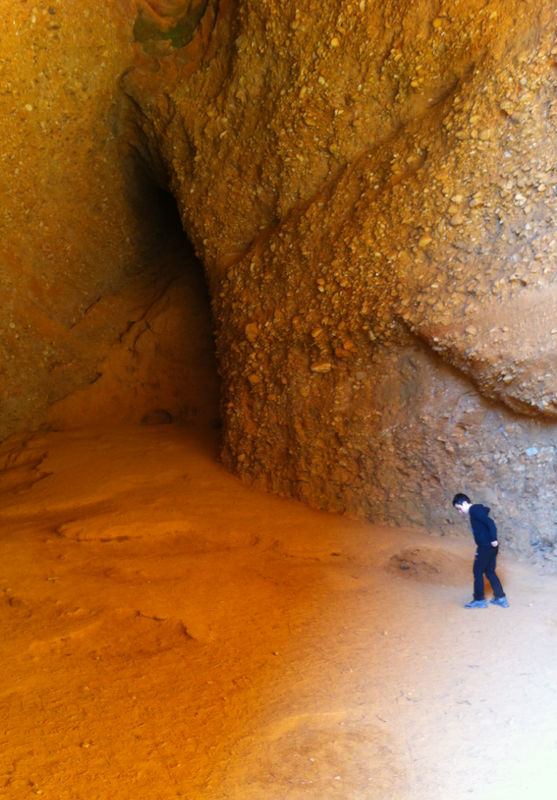 We decided to stay 2 nights in order to see some Easter processions and make a side trip to Las Medulas, the site of a large Roman gold mine. 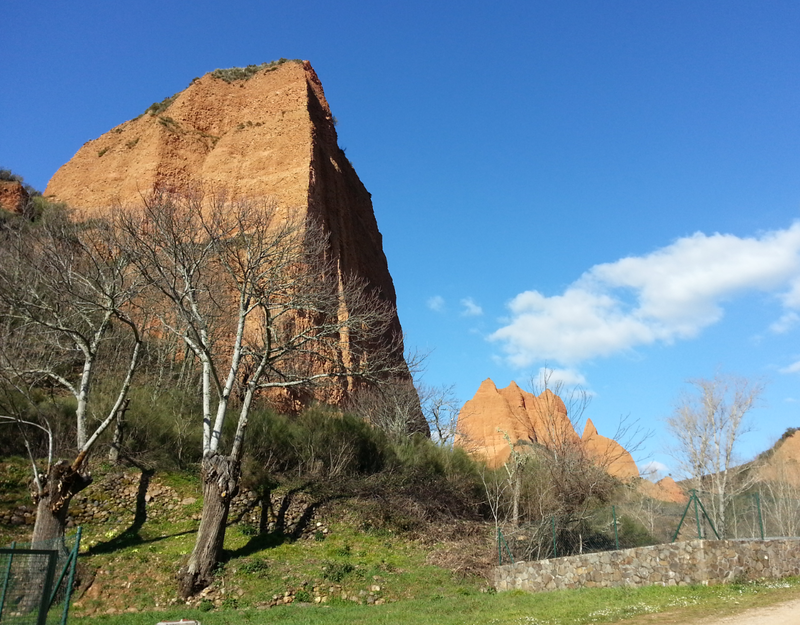 Carucedo and pointed to the road on the left and said that’s where to go for Las Medulas. 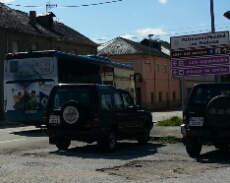 We had exactly 3 hours before the last bus for 4 days would pass by on the return trip. We scurried uphill along the highway for 4 km. Not much traffic, and we didn’t have backpacks. The red clay peaks came into view soon. 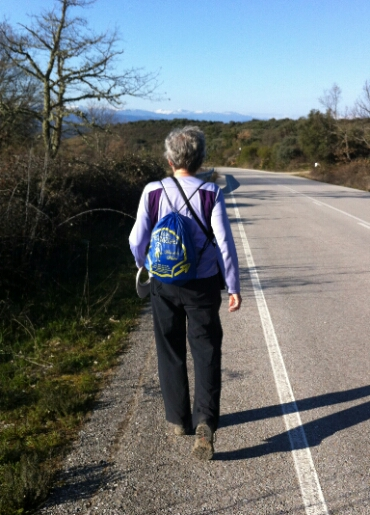 There were some Camino signs, because we were walking a piece of the Camino de Invierno! 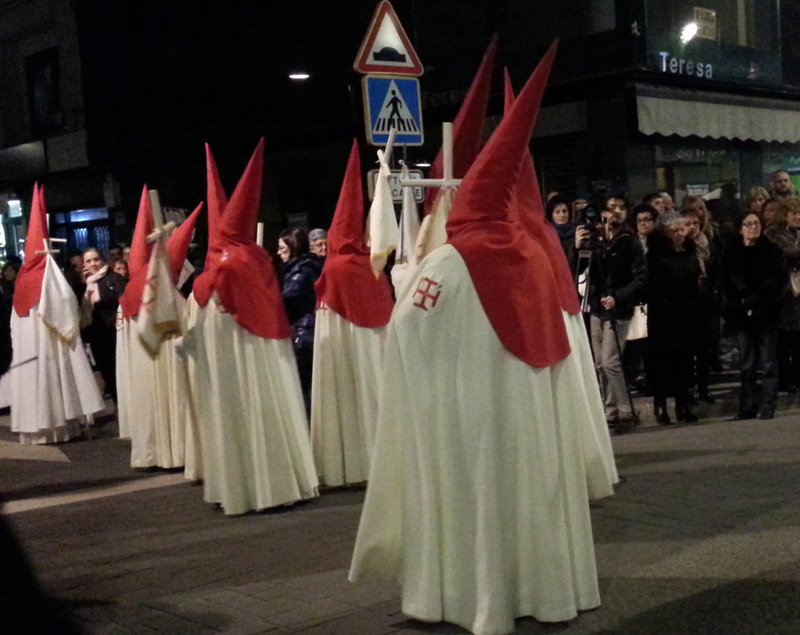 59 minutes later we were at the information centre, and rushed on to the recommended Cuevas. By the time we were back at the Info Centre and MB had a fast tour of the museum, we had 55 minutes before the bus was expected. At least the helpful fellow at the museum had given us a phone number for a taxi, in case we needed it. We trotted downhill at 6 km/h. This was 4 km rather steeply downhill. Note souvenir day pack from Hostal Asturias on the Via de la Plata. The bus was late but we eagerly flagged it down. No need to wave at it since the driver was the same one who had dropped us off. Back in Ponferrada we bought ingredients to make a delicious salad in our mini kitchen. 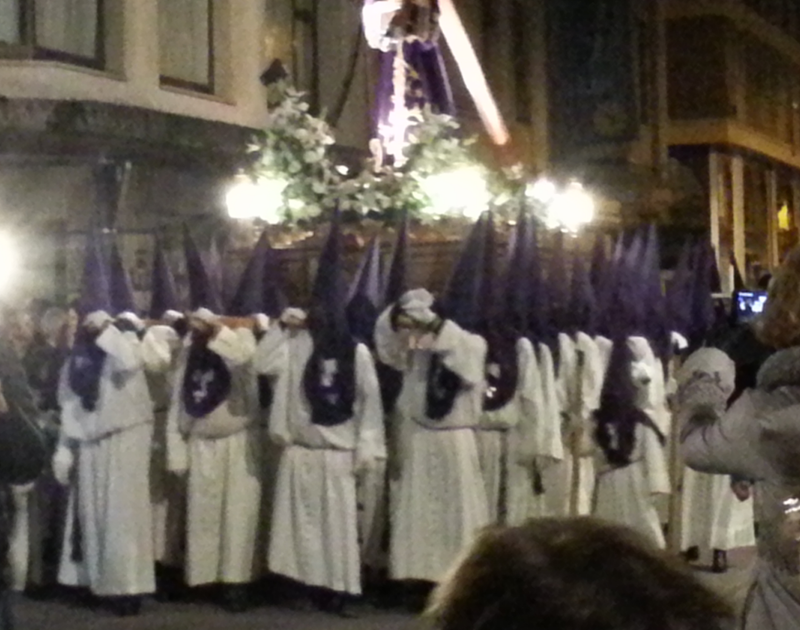 Then we went out to see the Easter procession. March 24, 2016 in Camino 2016, Camino de Santiago.